A novel approach that delivers miniaturized, hermetic, biostable and highly reliable smart sensor modules. The requirements for smart sensors are manifold: miniaturized, highly reliable and integrated, cost-effective, hermetic and biocompatible for medical applications. DYCONEX has developed novel and innovative methods to design, manufacture and realize such sensor modules. 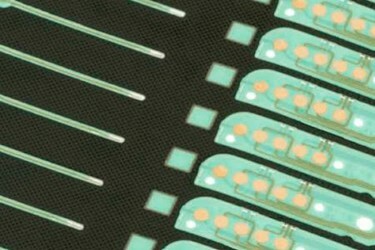 By combining thin film technology, as known from the semiconductor industry, with traditional flex circuit manufacturing technologies, substrates with enhanced properties can be manufactured and assembled with standard SMT processes. Liquid Crystal Polymer (LCP) as base material is a chemically and biologically stable thermoplastic polymer and allows for hermetic sensor modules having smallest size and lowest moisture penetration available today only with inorganic packaging materials. Large scale, automated production and inexpensive organic materials result in very competitive cost levels. Liquid Crystal Polymer (LCP) is a high performance thermoplastic material with excellent thermo-mechanical behavior, which can be thermoformed (even as a complex multilayer flex with embedded thin film traces) to any desired shape. At room temperature thin LCP films and fibers show mechanical properties close to steel. 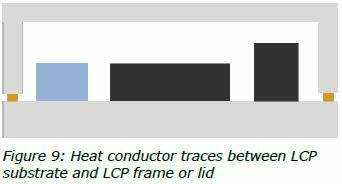 Operational temperature for LCP circuits can reach 190°C. Multiple, standard SMT reflow and soldering operations are possible. Other benefits are the low moisture absorption and chemical stability. LCP belongs to the polymer materials with the lowest permeability for gases and water. 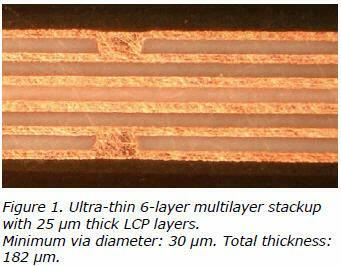 LCP can be bonded to itself, allowing multilayer constructions with a homogenous structure. LCP can also be used for housing and encapsulation. LCP adheres well to most materials, if sufficient roughness is provided. 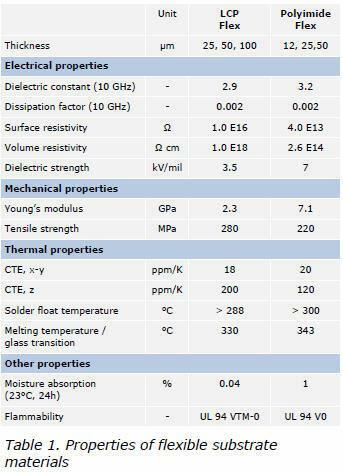 Table 1 compares the properties of LCP with Polyimide, which is the standard material used for high reliability flexible substrates. In contrast to LCP, polyimides are thermoset polymers, which require adhesives for the construction of multilayer substrates. Polyimides are thermoset polymer material with high temperature and flexural endurance. Standard PCB equipment and processes can be used to process LCP films. Multilayered substrates can be constructed with LCP films by laminating metallized and structured LCP cores with a lower melting point bond film. The LCP substrates can be assembled with SMT components and sealed with heat welded lids or frames from LCP to provide a homogenous, miniaturized and hermetic housing. The big benefit is the combination of standard flexible substrate technology with the thermoplastic material properties. LCP is the only thermoplastic material, which is fully compatible with PCB and thin film technology. The standard metallization of LCP is based on copper and can be copper electro-plated and structured using the same processes known from the PCB industry. If materials other than copper are required, traces can be deposited by thin film sputtering and are defined by photolithographic methods. All metals, alloys, or dielectric materials available for DC or RF sputtering can be deposited. These materials can be used in combination with copper structures for interconnect. The copper structures can then receive standard surface finishes suitable for SMT reflow and connector attach. Minimum trace resolution for thin film sputtered traces are about 15 μm, for standard copper traces 25 μm. Thin film thicknesses range from a couple of 10 nm to a few μm. In some cases (i.e. pure Au traces) it can be beneficial to increase the sputtered layer thickness with an electrolytic process to a higher thickness (i.e. up to 15 μm). Thin film resistors are made from sputtered resistive materials with sheet resistances between 1 and 5 Ω/□ with a temperature coefficient of 300 ppm/K. While thermistors provide an absolute temperature reading, thermocouples with a Constantan / Copper transition can measure temperature differences with a thermoelectric coefficient of 42 μV/K. Semiconductor dies can be embedded between substrate layers to encapsulate them from the environment. The semiconductor pads are connected through laser drilled, electroplated vias to a redistribution and fan-out layer on the next LCP layer. 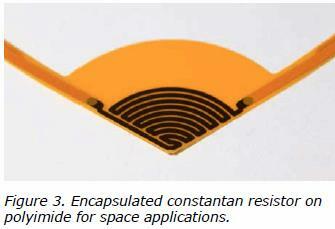 Standard aluminum pads on the silicon die are contacted through a thin sputtered interface layer to the copper vias. Via dimensions and registration tolerances are compatible with typical semiconductor pad layouts and dimensions. Silicon sensors dies, such as MEMS pressure sensors, laser diodes or photo diodes will need to be exposed to the outside in order to let the medium access the sensor surface. This can be accomplished by removing the LCP material in the area over the sensor surface. If more than a few components need to be assembled embedding might not be the most economic option. Solder reflow can be used to assemble SMT components. Leads from temperature sensitive components can be resistance welded to LCP. In order to achieve the smallest possible module size the substrate will be assembled only single sided. 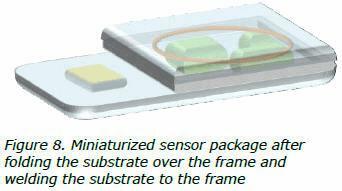 The LCP substrate can contain in inner layers embedded, sputtered sensor structures (e.g. 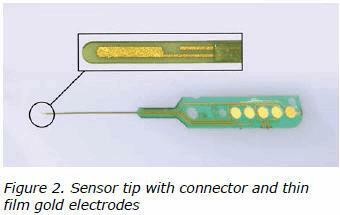 the thermocouples of Fig. 3 and 4) or an embedded silicon die (e.g. see Fig. 5). An injection molded frame from LCP will be positioned over the substrate to cover the height of the assembled components. Then the remaining substrate will be bent over the frame to form the cover. In such a configuration the LCP substrate forms the bottom and the cover of the module and the frame the side walls. The thickness of the walls will be as little as only 0.15 mm. The frame or lid will be locally welded to the LCP substrate. 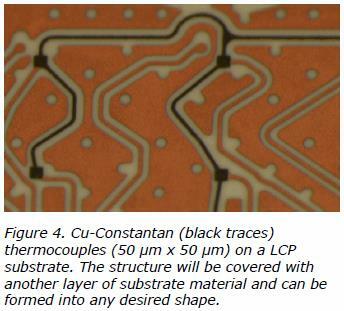 This will be accomplished by placing thin heat conductor traces on the top layer of the LCP substrate. Such heat conductors can be heated precisely with an electric current to melt locally the LCP material of the frame and the substrate. If this is done properly any interface between the different layers of LCP material will be completely removed at the periphery of the module and there are no paths for electro migration remaining, which could limit the hermeticity of the module. In order to evaluate the long term performance of components embedded into LCP, soak testing in liquids at elevated temperatures was used. 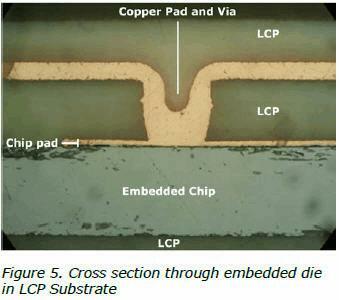 A test chip with a moisture sensitive, interdigitated structure on the silicon surface was embedded into a LCP substrate. The embedded test chip was put into small beakers and soaked with either PBS (phosphate buffered saline solution) or 80% sulphuric acid at 50 °C. 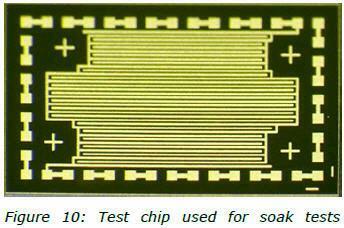 The resistance of the interdigitated structure on the test chip was measured over a period of 11 months (still ongoing) to detect any kind of moisture incursion into the LCP package. No resistance below the threshold of the instrument (10 GΩ) could be detected. 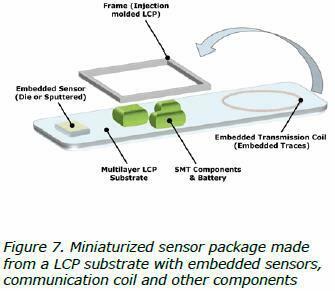 Miniaturized smart sensor modules can be fabricated from LCP substrates using conventional flex circuit, thin film and standard assembly processes and equipment. 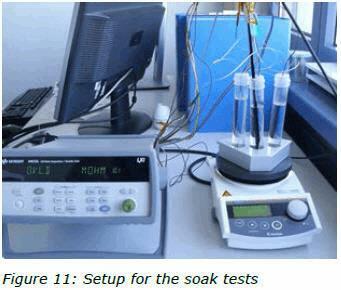 Passive structures have shown feasibility for long term stability in aggressive environments based on soak testing. Structures with embedded die show promise for stability after > 11 months PBS and sulfuric acid soak testing. These results demonstrate that a new material set comprised of LCP is feasible for producing complex structures for smart sensor modules in medical, food processing, pharmaceutical, chemical or industrial applications. Dr. Eckardt Bihler graduated with a PhD in solid state physics from the University of Stuttgart. In his more than 25 year career in the microelectronics industry he has collected considerable experience in ceramic and organic packaging, semiconductor design, photovoltaics and printed circuit board processing technologies. He works for DYCONEX as a business development and program manager for sensor applications. Dr. Marc Hauer is R&D and Engineering Manager at DYCONEX with 13 years of experience in manufacturing of printed circuit boards, sensors and biocompatible substrates. As Engineering Manager he is responsible for medical implantable and high reliability products. In his previous functions he was an application and product engineer. Marc holds a PhD in Laser material processing from the Swiss Federal Institute of Technology in Zürich (ETH) and is author of 18 scientific papers. Birgit Neubauer (Dipl. Ing.) has graduated as polymer chemist from the University of Applied Science in Reutlingen, Germany. For several years she has gained experience as R&D and application engineer at a German PCB manufacturer and has had the main responsibility for UL qualifications. Since more than 10 years Birgit is working as product engineer at DYCONEX AG and is involved in all major development projects.